Attackers fired on a plane carrying Ivory Coast's prime minister as it landed at an airport. Guillaume Soro was not harmed and was taken to a safe place, said New Forces spokesman Alain Lobognon, who was traveling with Soro. There was initial confusion, with Lobognon first saying a convoy in which Soro was being taken from a northern airport was fired on, but later saying Soro's plane was attacked as it landed. Sidiki Konate, another Soro spokesman who was with him on the plane, told French radio that as the plane landed at Bouake airport, roughly 400 kilometers (250 miles) from the main city, Abidjan, "you heard the sound of heavy explosions and then several volleys of shots." He said the pilot was able to land, but with such force that three people were killed. Lobognon also said three people were killed. "Many were also injured, seriously. 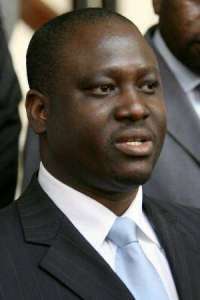 The prime minister was unhurt," Konate said. Soro became prime minister of Ivory Coast in April following the signing of a peace deal between his New Forces rebels and the government. Following a brief civil war in 2002, Ivory Coast was divided into a rebel-controlled north and a government-ruled south. Friday's attack could set back Ivory Coast's nascent peace deal, brokered earlier this year in neighboring Burkina Faso. Under the accord, Soro joined hands in government with his former enemy, President Laurent Gbagbo. Before becoming prime minister, Soro had headed the rebels from Bouake, while Gbagbo governed the south. About 9,000 U.N. troops and 3,500 French soldiers are deployed in Ivory Coast to ward off all-out civil war. Many used to patrol the giant buffer zone that runs east to west, dividing the country in half. Since the signing of the peace deal on March 4, Ivorians have begun dismantling the buffer zone, and international peacekeepers were beginning to pack their bags. The world's largest cocoa producer has embraced a series of peace deals in recent years, but so far none have taken hold. The most recent, known as the Ouagadougou accord after the capital of Burkina Faso where it was signed, has been seen as the most promising. The French foreign affairs minister, Bernard Kouchner, issued a statement in Paris condemning Friday's attack, and offered medical assistance in Bouake. France "underlines the overriding necessity of continuing the reconciliation process started under the Ouagadougou accord," Kouchner added in a statement.